The body fat hypothesis originates from observations showing that females with extremely low body fat where amenorrheic (absence of menstrual cycles for more than 90 d) and that amenorrheic athletes had lower body fat percentages than eumenorrheic (normal menstrual cycles) athletes. But, when simply matching eumenorrheic and amenorrheic athletes for body fat, it was found that the body fat hypothesis could not explain the prevalence of menstrual dysfunction in athletes. Amenorrhea often occurs in the general adolescent female population, even in the absence of substantial undernutrition or underweight, and there are many underweight and lean athletes who still maintain their menstrual function. Sudden strenuous exercise induces amenorrhea in humans and more so if the exercise is compounded by weight loss. This caused scientists to speculate if a negative energy balance is a causal factor in menstrual disturbances. It was in researching this I stumbled over the work of George Wade, and he really opened my eyes. Starving an animal will cause it to lose its reproductive function. The simple explanation of why an energy deficit causes disruption of the reproductive function is that reproductive function has a low priority in the survival of mammals. Functions essential for survival are those of basic cellular maintenance, keeping correct body temperature and locomotion to obtain food. These functions are maintained at the expense of other functions (e.g. reproduction, storage of energy as fat and growth). When energy balance is discussed, it is implicit that we are discussing the whole body. But the theory of energy balance is inaccurate when simply defined as “energy intake minus energy expenditure.” It is inaccurate simply because the energy availability of the whole body does not necessarily reflect the energy availability of specific cells (e.g. the ovarian cells). So the important question is not necessarily if the body is in a negative energy balance, but rather what factors may cause a local energy deficit independent of total energy balance? Although a restriction in dietary fat intake is often found in athletes, it is not often referred to as an independent hypothesis. This might seem odd, given that there do exist a perfectly reasonable physiologic explanation for the link between dietary fat and menstrual disorders. A diet comprising of mostly carbohydrates is more likely to give higher insulin load than diets with more fat and protein. Injected insulin disrupts reproductive function in animals. In the words of Wade et al. “When food intake is limited or when an inordinate fraction of the available energy is diverted to other uses such as exercise or fattening [my bold], reproductive attempts are suspended in favor of processes necessary for individual survival”. In animal studies, feeding a high-fat diet may ameliorate reproductive deficits. Energy deficits resulting from inadequate energy intake are also more extreme when consuming a high carbohydrate diet. Obese women also seem predisposed of menstrual disturbances. Many women get pregnant only after loosing weight. This may seem counterintuitive. Wouldn’t nature prefer a mother with large energy stores and thus a grater chance of caring for her young through hard times? Well, as it seems, nature would prefer a certain amount of extra available energy, as illustrated by the loss of menses with extreme leanness. But, in the case of overweight and obesity we are fooled by an apparent surplus of energy. To be more precise, the fat cells have a surplus of energy, but that tells us nothing of the energy available for other tissues. The menstrual disturbances in athletes are in part likely caused by low energy availability for the ovarian cells, and when we are talking reproduction, these are the cells that count. 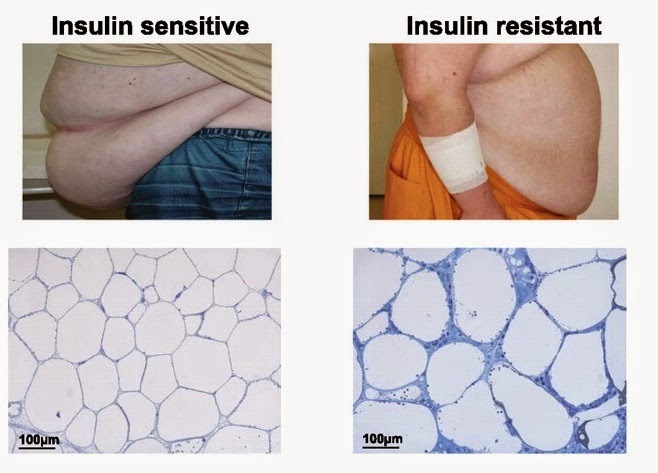 Yet another indication that a local starvation may exist is a finding that myostatin secretion is may be close to 3 times higher in insulin resistant obese subjects than in lean controls. Myostatin is a natural regulator of muscle tissue growth. Removing myostatin will make you look like a human version of the Belgian blue (just type myostatin in Google). Increased myostatin secretion is seen with fasting, hunger and very low energy intakes. This might be an important evolutionary adaptation by which our body breaks down superfluous muscle protein for glucose production. When muscles are insulin resistant, they cannot take up sufficient glucose. In addition a high insulin level may make stored fat unavailable. So from the muscles point of view the body is starving independent of the amount of stored energy in the body. For an overweight insulin resistant person this may become a downward spiral with a gradual decreased ratio of muscle mass to fat mass. Insulin resistance and polycystic ovarian syndrome are commonly associated. PCOS is a condition characterized by excessive cyst growth on the ovaries and will often cause infertility. Funny thing is that this condition is best improved by carbohydrate restriction. One explanation is an improved energy flow to the ovaries. As a final closing argument several studies of carbohydrate restriction have reported muscle growth without increases in exercise level. It is as if the muscles are finally given the energy they need to respond and grow to mechanic stimuli.